The Cathedral is open for sightseeing from Monday to Saturday between 08.30 - 16.00 (last ticket sold). On Sunday the Cathedral is open for worship only and there is no admission for sightseeing. The galleries are open to sightseers Monday to Saturday between 09.30 - 16.15 (last admission). Please note that children must be accompanied by an adult when visiting the galleries. Occasionally adverse weather may close the Stone and Golden galleries. Special services or events may close all, or part, of the Cathedral at short notice, so please consult the Cathedral calendar for more details. A guided tour of the Cathedral and Crypt lasting 90 minutes.Tours commence at 10.45, 11.15, 13.30 and 14.00 (limited numbers). The nearest Underground station is St Paul's on the Central Line (2 minute walk). Mansion House and Cannon Street stations on the District and Circle Lines are also within walking distance. Central line trains run every four minutes on weekdays and every six minutes at weekends. NB: BLACKFRIARS Underground station is currently closed for renovation. The overground station remains open. Please note that not all of these stations can be accessed by people in wheelchairs. Please contact London Transport for information about the closest station to the Cathedral with wheelchair access. The major local over-ground stations are London Bridge (20 minute walk), Cannon Street (8 minute walk), and Blackfriars (5 minute walk). Free bicycle parking is provided in designated places on streets throughout the City. To view a list of free bicycle parking spaces please click here. 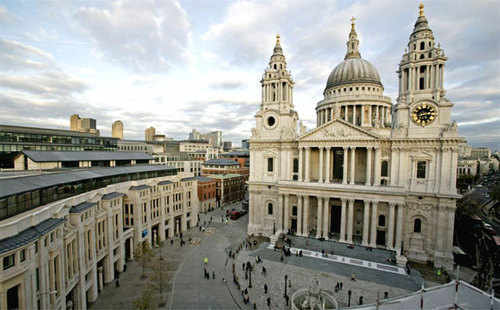 Visitors to St Paul's are advised to arrive by public transport whenever possible. There is a public car park on Queen Victoria Street to the south of the Cathedral. On-street parking is very restricted around the Cathedral itself, but there is limited parking in the Cathedral's coach park for cars displaying a disabled badge. At St Paul's Cathedral, the menus in both the restaurant and the café have been developed to reflect the best of British produce. This means sourcing local, seasonal ingredients, and cooking them simply and beautifully. Open 9am - 5pm Monday to Saturday and 12 - 4pm Sunday. Our café is a showcase for traditional British baking serving up such homemade delights as Richmond maids of honour, Wiltshire lardy cake, Chelsea buns and Victoria sandwich cake. We also serve delicious soups and sandwiches and have a daily changing menu of salads and savoury tarts. Further choice is available from the Barrow in the Crypt where you can pick your own ploughman's lunch, choosing from a variety of British cheeses, cured meats, pickles and artisan breads; many of these ingredients coming from nearby Borough and Spitalfields Markets. Our restaurant menu includes a fixed price lunch, again using the best seasonal ingredients, with 2 courses for £20 or 3 for £24. Each afternoon we celebrate traditional afternoon tea with delicate sandwiches, scones with clotted cream, cakes and a selection of teas or, for an extra indulgence, a glass of English sparkling wine. Harbour & Jones are the in-house caterers at St Paul's Cathedral. This young, innovative catering company produces fabulous food and exceptional service delivered by highly motivated and professional staff.